May 9: After becoming Harvard's fourth Hobey Baker Award winner in program history, Vesey (second from the left) was honored alongside the Crimson's first three winners at a reception in Downtown Boston. Three years ago the Harvard men's hockey team faced crises on the ice and off as they limped to consecutive 10-win seasons and lost players to a campus-wide cheating scandal. Now they've returned to the NCAA Tournament in consecutive seasons, anchored by the best player in college hockey. Here’s how it happened. Jimmy Vesey (second from left) is the fourth player in Harvard history to win the Hobey Baker Award, joining Lane MacDonald '88-'89 (left), Scott Fusco '86 (second from right), and Mark Fusco '83 (right). The four winners were honored Monday night at the Downtown Harvard Club of Boston. There were times when I didn’t love The Crimson, but they are dispersed thinly among moments when 14 Plympton was great to me and so many others. At least they don't try to sugarcoat it: My.Harvard acknowledges "four sign-in issues that we know of" on the site's main login page. It’s the first Independence Day I’ve spent away from home, and after an oddly difficult bout of homesickness on Thursday, baseball is how I’m coping. Sam Lynn Ballpark in Bakersfield, Calif. The lineup board at Sam Lynn Ballpark in Bakersfield, Calif. In case you haven’t heard, today is Commencement. 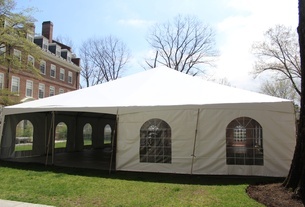 Thousands will flood Tercentenary Theater (that patch of grass and trees between Widener and Memorial Church) to see the College’s seniors and thousands of students from other Harvard schools earn their degrees. Don’t forget your gown and your Harvard ID! You’ve made it this far, seniors! Today, your challenge is to survive the deluge of family commitments and posed photos that Commencement brings. We know you can do it. With demonstrations occurring almost daily on and near Harvard’s campus since controversial grand jury decisions in Ferguson, MO., and Staten Island, NY., University President Drew G. Faust and Dean of the College Rakesh Khurana addressed the situation in separate statements this week.